Hailed as the Fruit Basket of the Philippines, Davao is one of the world's leading producers and exporters of banana, papaya, mangosteen, and even flowers. 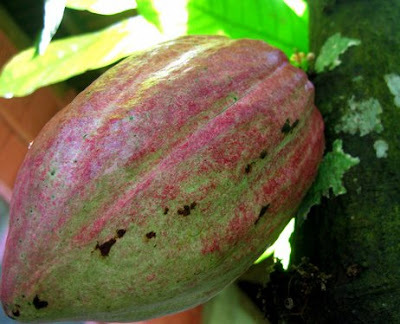 Davao's rich fertile volcanic soil makes it most suitable for sustained production of the freshest and tastiest tropical fruits in the Philippines. Since the fruits are locally produced, the prices are comparably much cheaper than anywhere in the country. Below is a brief outline of some of the fruits in which Davao is famous for. I will feature and discuss at length some of these fruits in my future blogs. Durian - the "King of Fruits"
Durian has become almost synonymous with Davao because of its abundance in the region and, because of its scarcity in the other parts of the country, many have sought after this exotic fruit. Banana is the leading fruit grown in the Philippines and a consistent top dollar earner. 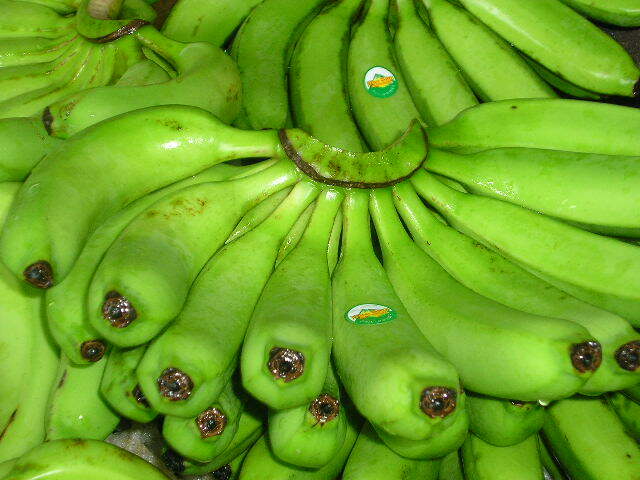 The Cavendish variety of Davao City is considered one of the best in the world. 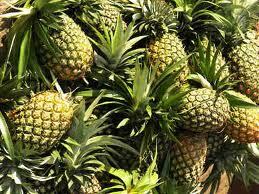 Davao is one of the top producers of pineapples in Asia. Davao Pineapples are bright orange in color and not the usual pale yellow. They are small but sweet, and are exported in countries such as Japan, Hong Kong, South Korea, Middle East, and and New Zealand. Pomelo belongs to the Citrus family and it is one of the largest and juiciest fruits in the world. 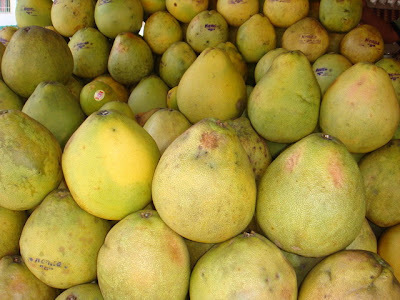 Davao is a major exporter of Pomelo in the world. 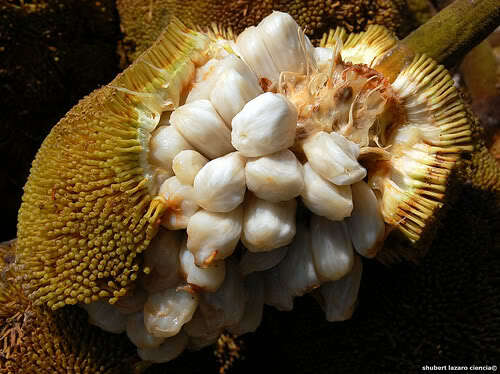 Marang is an exotic fruit akin to a jackfruit and breadfruit, and is very abundant in Davao. While it usually gives off a pungent odor, especially when ripe, the fruit is delicious, soft flavoured and is considered superior in flavour to both Jackfruit and breadfruit. 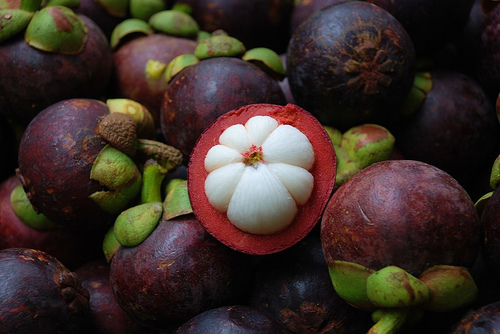 Among the major fruit crops of the Davao Region is the Mangosteen. Every street corner of Davao City is abundant of this sweet "citrusy" fruit that is widely known for its health benefits. 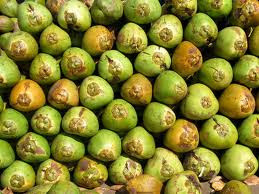 The fruit is said to be effective in the treatment of diarrhea. Lansones grows abundantly in Davao Region. The fruit has an acidic taste and bitter seeds but the translucent flesh can be very sweet when ripe. 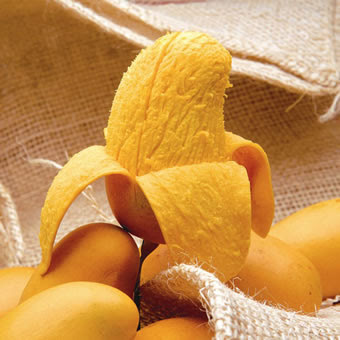 Dried lansones peelings when burned is an effective alternative fumigation against mosquitoes. Davao Rambutan is arguably the best in the Philippines. It is oval in shape, about the size of a golf ball, red in color, and have spikes sprouting that resemble hair which are not at all hard nor prickly, but are soft and easy to break the skin open. The Mango is the National Fruit of the Philippines and is considered the Apple of the Tropics. Davao mangoes are classified as export quality, local and premium grade. 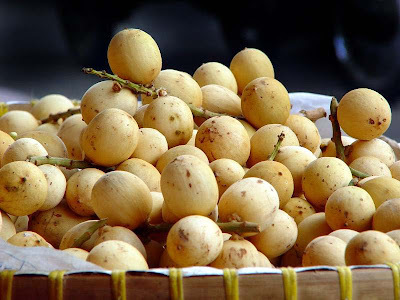 Two varieties are commonly grown: the sweeter manggang piko, and the fleshier manggang kalabaw - the ripe ones having yellow skin and flesh, which is said to be at their sweetest. Papaya is one of the major crops grown in Davao Region particularly in Compostela Valley, Davao del Norte, Davao del Sur, and Davao Oriental. Papaya fruits are good sources of Vitamin A, B and C. Bruised papaya leaves are widely used in treating rheumatism, and also as an effective purgative. Fresh Sweet Solo Papaya is the common variety grown in the Davao Region. Watermelon is abundant in Davao, and is one of the major crops in the region. While the Davao variety is not as prominent as its red counterpart, it is sweeter than the red ones. 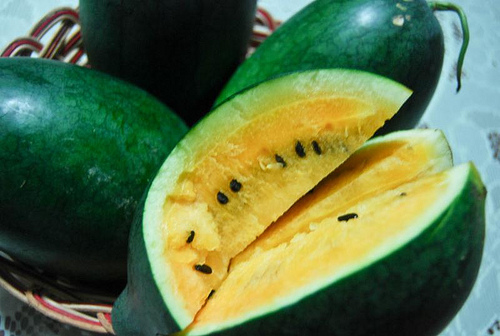 Watermelon contains about 6% sugar and 92% water by weight, and as with many other fruits, it is a good source of vitamin C. The inner rind of the watermelon, which is usually light green or white in color is edible and contains many nutrients despite its unappealing flavor. 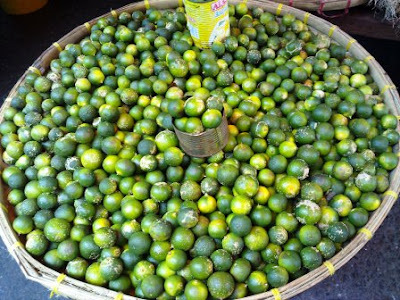 Calamansi is the most popular, and one of the most commonly used citrus fruits in the Philippines, and is one of the major fruit crops in Davao. It is in season year round and is utilized in many ways: to make beverages, and for flavoring. Calamansi contains calcium, phosphorus, and potassium, and is high in vitamin C.
Cacao is considered an equatorial crop that thrives well on regions occupying the equator, and Davao, whose climatic conditions and soil characteristics are conducive to growing cacao, is now a major source of best quality cacao in the world market. Coconut - the "Tree of Life"
Coconut is called the "Tree of Life" because of its many uses and versatility. It is one of the most important crops in the Philippines due to its substantial foreign exchange earnings. The country is one of the world’s leading suppliers of coconut products which include copra and coco oil, and Davao is the leading coconut producer in the Philippines, producing an average of one billion nuts annually. Coconut products are among the top ten export commodities of Davao Region. Davao is most suitable for sustained production of quality vegetables as the region does not experience typhoons, and the land consists mainly of rich fertile volcanic soil. Major vegetable produce include mongo, peanut, cabbage, eggplant, tomato, camote, and cassava. Priority commodities in the Davao include habitchuelas, banana blossom, cauliflower, kangkong, lettuce, pechay, ampalaya, siringbeans, gourd, okra, squash fruit, ginger, pepper, carrots, gabi, raddish and potato. Hi Liezl, Kadayawan festival is a celebration of life of the Dabawenyos, a thanksgiving to the bountiful harvest of its agricultural produce, among the many other blessings Davao City enjoys. This is one occasion to really look forward to! i love fruits, and i love this blog as well. Hi Eddel29! I am glad that you love my blog on the Fruit Basket of the Philippines which I posted in July 9, 2011. I hope you will drop-in again for fresh posts and updates. i love to read your blog. full of info. on Davao. 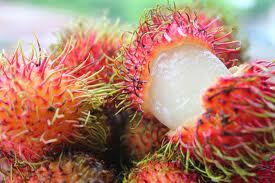 Especially their tropical fruits and durian especially. 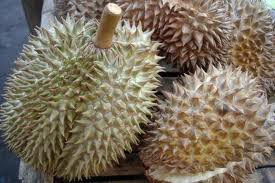 when is the next durian season. looking forward to visit Davao coming July or August. Thank you for your comments of March 10 on my blog post, "Fruit Basket of the Philippines", dated July 9, 2011, and I personally look forward to your visit to Davao City soon. 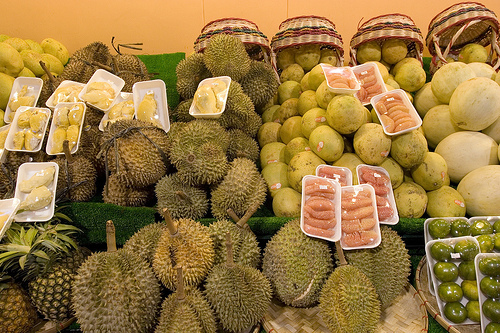 Although Durian is usually in season during August to October, it is available year-round, and the best place to buy Durian is in Magsaysay Fruit Market along Quezon Boulevard. You will find Durian in all other fruit stands and markets in the City, but the Magsaysay Fruit Market is known to have better stocks, more variety, and cheaper price. Durian is widely known as the "King of Fruits", and is abundant in Davao because of Davao's rich fertile volcanic soil and climate which make it most suitable for sustained production of the freshest and tastiest Durian. Since the fruits are locally produced, the prices are comparably much cheaper than anywhere in the Philippines. I hope so too! I miss the Kadayawan Festival and Davao City itself. Hope to be back in the not too distant future.